Become a visionary who creates a healthy work environment and propels your organization to greater heights. This Master of Business Administration (MBA) – Human Resource Management program will equip you in labor relations, staffing, training and development, and other facets of human resource management. 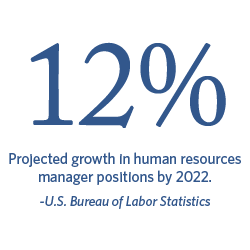 Our MBA HR program aligns with the Society of Human Resource Management's (SHRM) core curriculum guidelines. Learn to communicate HR vision, practices and policies in a way that positions you as a strategic business partner with organizational leaders. Examine the National Labor Relations Act and keys for negotiating wages and other employment conditions to improve organizational effectiveness. Gain eligibility to apply for the SHRM Certified Professional exam (must be in final year of study, be in good standing as defined by Regent University, and possess minimum 500 hours of relevant HR experience). Taught from a Christian perspective, our Master of Business Administration is ranked as one of the best online MBA programs in Virginia. ACBSP accredited. Incorporate HR practices into your business’s strategic goals. Demonstrate expertise in required SHRM areas including change management, globalization, job analysis and job design. Create a plan to train and enrich your employees from orientation to executive development. Foster relationships with stakeholders that are based on teamwork, trust and direct communication. The training and development function at all levels from initial orientation to executive development. The National Labor Relations Act (NLRA) and collective bargaining concepts and issues in contemporary organizational life. Investigates principles and current issues in performance management systems and methods. Key issues and trends in Strategic Human Resource Management with a focus on planning, strategy formulation, and implementation of initiatives aligned to the business results in an organization. Required during the first semester of enrollment. Includes instructional materials and assessment measures in compliance with the Accreditation Council for Business Schools & Programs. Pass/No Pass. Required during the last semester of enrollment. Includes instructional materials and assessment measures in compliance with the Accreditation Council for Business Schools & Programs. Pass/No Pass. The role, purpose and ethical conduct of business organizations. Discovering one’s life purpose and developing a plan to pursue it with excellence and integrity. Developing and applying ethical reasoning skills and one’s values to a wide variety of ethical issues in business. The intersection of economic thinking and Christian worldview, especially related to basics of efficient production management, personnel economics, and price determination. Present and future elements of technology with a specific focus on the innovative development and integration of technology in the modern enterprise. Likely paradigm shifts in global industries such as telecommunications, nanotechnology, bioinformatics, and energy to determine immediate and future implications on commerce. Applies market analysis techniques with demographic research to identify a specific set of ideas and actions to guide decisions on the best or chosen way to feasibly create, distribute, promote, and price a product or service. The foundational theory, principles, and skills by which a senior executive leads the people in the organization. Running a business from the perspective of a general manager of either a business unit or the whole organization. Executing the firm’s plan and coordinating every aspect to achieve company goals. Specific accounting issues relate to financial statement reporting, revenue and expense determination, asset classification and sources of capital. Concepts in financial management including financial evaluation, financial forecasting, working capital management, capital budgeting, long-term financing, valuation and cost of capital. Prerequisite: MBA 650. Modern approaches to managing the design, operation, and improvement of systems and processes, and also the creation and delivery of firms’ products and services. Detailed plan development for a company project, expanding an existing product or service line, creating a new business venture, or producing a new product or service. In this exploding age of information, it is the objective of the library faculty to prepare graduates to be on the cutting edge of information technology. Information literacy is the ability to effectively access information for problem solving and decision-making; thus, the knowledge and abilities you glean from this course will open doors to lifelong learning. It is imperative for graduate study research. Since the information learned in this course is a vital foundation for all other coursework, its completion is required within the first semester of study. The course takes approximately ten hours to complete. All new students are expected to check-in for the semester 2 weeks prior to the session start date. Students should apply, be accepted, enroll in their first courses, and confirm a plan to pay for their courses prior to this date. Hold a bachelor's degree from a regionally accredited institution or an equivalent degree from a foreign institution, as evaluated by a credential evaluating agency. Submit all application materials such that they are received by the application deadline. Admission interviews are by invitation only and may be requested. Note: If you are unable to complete our application due to a disability, please contact our Admissions Office for assistance. Pay via the online application process or by check or money order mailed to Regent University, Enrollment Support Services, 1000 Regent University Drive, Virginia Beach, VA 23464. Unofficial transcripts from a U.S.-based school, indicating successful completion of a bachelor's degree program, can be used for an admissions decision. Submit your unofficial transcript to transcripts@regent.edu using the subject line: SBL Master's Application Pieces. Non-U.S. transcripts must be evaluated by an NACES-approved company. See the International Admissions Checklist for details. *Upon conditional acceptance to the program by review of unofficial transcripts, Regent University will attempt to obtain your official transcripts from your U.S. degree-granting institution, which indicate successful completion of a bachelor's degree. We will notify you if your previous institution will not release transcripts directly to us. Email your resume directly to the Admissions Office at apply@regent.edu using the subject line: SBL Master's Application Pieces. To ensure academic integrity, Regent University requires a copy of a government-issued ID. Simply scan and upload a copy of your driver's license, high school ID, passport, permanent resident card or official government ID card, using our secure and convenient online tool. If you would prefer to take a picture of your government-issued ID and email that to our office, please attach your ID and email to apply@regent.edu with the subject line: Government ID. Visit the International Student Admissions page for additional admission requirements and to determine if you qualify as an international student. Note: All items submitted as part of the application process become the property of Regent University and cannot be returned. *Rates are subject to change at any time. The per-credit-hour tuition rate is for SBL master's-level courses only. Concentration courses taken from the other Regent schools are charged at that school's tuition rate. 1. Why Regent for my MBA? Christ-Centered. With a strong spiritual integration throughout all courses, the MBA program blends biblical principles and scriptural examples with modern-day business practices. Globally-Based. Led by an international faculty, worldwide business and cultural perspectives are integrated throughout the coursework. In the classroom and through virtual discussion boards, students from around the world provide cultural insight and are taught how to approach business from a global perspective and become a globally competent leader. Entrepreneur-Focused. Entrepreneurial and creative skill sets are essential components in every course. The program examines the business model holistically, employs creative strategies and looks at subjects from all perspectives of an organization. 2. What is the advantage of earning an MBA at Regent? Regent's MBA is highly customizable. Students can choose from traditional elective concentrations or they can develop their own individualized plan to meet specific career objectives. Course projects can be applied to professional work situations. Students may advance a project at work by using the course to conduct market research or construct a specific plan of action. The coursework is relevant to different stages in a student's life. Younger students will use the program to build career paths and advance within organizations. Older students will often cultivate new skill sets to equip themselves to advance in key leadership and management opportunities. On-campus and online courses can be blended for the best of both worlds. Business travel will not interrupt the on-campus student, as their assignments and academic work can continue online while they are on the road. Online students are always welcome in the classroom when they visit Virginia Beach. The projects in each course provide the opportunity for students to create portfolio-quality material. On more than one occasion, Regent MBA students have demonstrated their knowledge and experience in a job interview by sharing the professional plans they have developed in the classroom. Remain a full-time, working professional – Courses can be taken part-time and 100% online. Course projects throughout the program can be applied toward a student's current professional employment. As a result, a student can be conducting research for their company, applying what they're learning in their organization, and building their portfolio toward future career endeavors. Jumpstart your career. A recently graduated student looking to get their career started can conduct research in their areas of interest, complete projects in the traditional business competencies covered in the program (but from a holistic perspective), and gain all this knowledge while building a portfolio they can bring to a job interview to showcase the tangible outcomes of which they are capable. Support an entrepreneur. Simply put, many Regent students build their company through the MBA degree program. Each course lays another foundational block in the key areas of business, while students construct a business plan throughout the program. Many will utilize the last core course in the program to launch their initiative. 3. What is the difference between ACBSP and AACSB accreditation? Regent’s MBA program is accredited by the Accreditation Council for Business Schools and Programs (ACBSP). Another accrediting agency for business programs is the Association to Advance Collegiate Schools of Business International (AACSB). Both accreditations indicate top-quality academic programs, but there are a few differences in qualifying criteria. ACBSP – Established in 1988, ACBSP accredits business education programs at all levels of higher education, from associate to doctoral-level degree programs. ACBSP recognizes excellence in teaching, considers tangible learning outcomes and requires continuous quality improvement. These qualifying factors ensure that the business program provides students with the knowledge and skills most sought after by employers. ACBSP is known as a leader among accrediting agencies with regard to learning outcomes. AACSB – Established in 1916, specializes in accrediting business and accounting programs from the bachelor’s to the doctoral level. While AACSB considers continual quality improvement, it also requires faculty members to produce focused research that advances business theory while maintaining their teaching responsibilities. Programs accredited by AACSB are primarily located within larger schools whose emphasis is on faculty research and publications. 4. How much time should I plan to spend on my coursework? Regent's MBA program utilizes an 8-week course schedule. Students working full time can take courses part time by concentrating on one course every 8-week session. At that pace, students can still complete the program in a timely manner. If students are interested in full-time study, they can take two courses every 8-week session, which will allow them to complete the program in 16 months. For each 8-week course, a student should set aside approximately 12-15 hours per week to commit to their coursework. 5. What is the process to get started toward my MBA at Regent? We have a minimal admissions process driven by the motivation of the applicant and the academic records, work history, and the specific qualifications that provide the best fit for the curriculum: Christian leaders to change the world. While prior academic experience is considered, a significant part of the committee's interest is in an applicant's resume and admissions essay. The admissions committee is always looking for prior management/leadership experience (in school or the workplace), evidence of self-motivation and ambition, entrepreneurship (we want to know about your lemonade stand! ), international experience, initiative, problem solving, and service. We're looking for that "good fit" between MBA program competencies and the applicant's goals for their education and future endeavors. The specific criteria can be found on the MBA program pages. "I felt that Regent gave me a family connection." "I was particularly impressed with the highly organized online Ph.D. program. The faculty is second to none when it comes to their intelligence, teaching ability, compassion and their desire to work with students." "As a Mexican American growing up in a predominantly Hispanic community, I grew up with the mindset that I was not college material. Regent has given me the opportunity to pursue my dream and become what God has destined in me." "I came away from my program at Regent with an increased confidence in my ability to lead an organization and the skills I needed to do it."